At ABC Signs, we understand that purchasing a quality sign can be a significant investment. Since effective signage is such a critical component to the success of most businesses, we offer sign leasing options to meet your needs when the funds for a new sign are not readily available. According to Equipment Leasing Association research, leasing is the method most frequently used for acquiring equipment of all types, including signs. 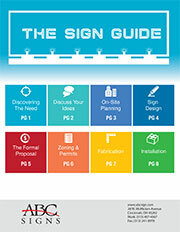 Getting your new signage from ABC Signs is easy and affordable with a leasing program. You will pay a low monthly lease payment that can easily fit into your business budget. Your payments are fixed, which means you will never have to worry about increases. You enjoy flexible end-of-term options, with buy-outs ranging from $1 to 10%. Enjoy tax benefits by deducting your lease payment as an operating expense. You can also reduce Alternative Minimum Tax (AMT) tax liability by leasing. Leasing allows you to preserve cash flow for your business, so you’ll have funds for your other expenses. Fixed monthly payments help you to improve financial forecasting, helping you plan future budgets. If you’d like to learn more about leasing a sign, or are ready to discuss your sign project, give us a call at (513) 407-4367 or email us today!